and a caboose in back. Sleep Train by Jonathan London and Lauren Eldridge is a bedtime story about a little boy counting the train cars of the train he's riding in -- instead of sheep. He's in the sleeping car, "all cozy in bed" (a very fancy sleeping car), reading the same book we are. 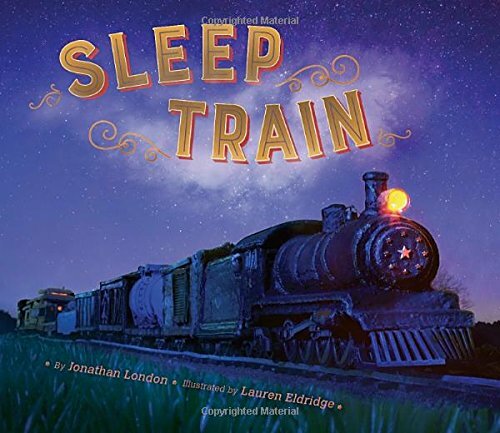 While he lies in bed counting the cars, the reader gets to learn about the different types of train car: tender, boxcar, tank car, cattle car, hopper, gondola, flatbed car, coach, dining car, and sleeping car, each illustrated and labeled. The engine and caboose are mentioned in the opening but not added to the count. And, he slowly falls asleep. Recommended - I'd particularly recommend this book to lovers of anything that moves (my eldest son was one of those -- and still is). Not only will the train enthusiasts love the beautiful illustrations but they'll also get to learn about the types of train cars that they see when stopped at a train crossing. The illustrations are dark and soothing, but the book loses a point for words like "jiggling" and "clickety-clack" that are not particularly relaxing to hear. There are other words that have hard sounds or sound upbeat, so you have to read the book very softly to make it sound soothing. But, it's easy to slow down and lower your voice even more, toward the end of the book, to make it a little more relaxing. And, I can't say enough about the insanely gorgeous illustrations. They are absolutely beautiful. ©2018 Nancy Horner. All rights reserved. 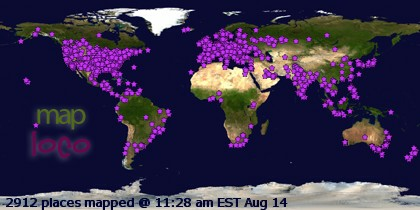 If you are reading this post at a site other than Bookfoolery or its RSS feed, you are reading a stolen feed. Email bookfoolery@gmail.com for written permission to reproduce text or photos.